Most of us have felt it. Often, though, we don’t know what to do about it. It’s the stuck-in-the rut feeling we get when time spent with God leaves our spiritual palate dry and stale rather than full and satisfied. Or when we know we should be spending time with God, but we can’t quite figure out what to do. Or when we know what to do, but can’t seem to fit it into an already jammed schedule. If your devotion time with God feels stuck, you aren’t alone. Feeling stuck isn’t necessarily a bad thing; it can be a good thing when it serves as a catalyst for change. But how? 1. 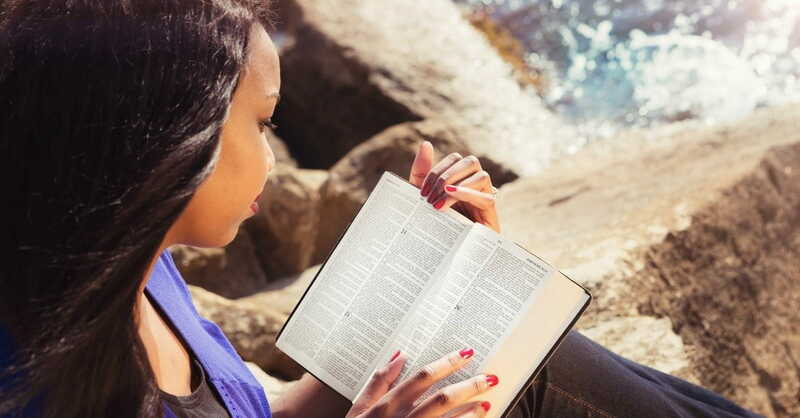 As you begin your quiet time, pray, “Lord, if you were here with me right now (and you are) what would you say to me today?” Open your Bible and begin reading. When you come to a verse that resonates with you or your circumstance, stop reading. Write the verse down, word for word. Realize God has heard and answered your prayer. He’s had a conversation with you. 2. Save time by knowing where you will read before you begin your devotions. Pick one book of the Bible and work your way through it. If Bible reading is new to you, start with the gospel of John (the fourth book in the New Testament). If you read one chapter of John a day, you’ll complete the entire book in 21 days. 3. Write out your prayers (not a prayer list) longhand or even on your laptop. Don’t worry about handwriting or spelling. Just write. This will keep your mind focused and your senses keen. 4. If you usually read a devotional, read the Bible. 5. If you usually pray silently, pray out loud. 6. If you usually read short portions of Scripture, try reading longer portions, which can give you a broader context. Pick a short book of the Bible and read it in one sitting. 7. If you read longer portions of Scripture, try reading shorter portions. Sometimes less is more if it means you’ll remember and apply what you read. 8. When reading a passage of Scripture, ask three questions: Lord, what do you want me to know? What do you want me to feel? What do you want me to do? Not all passages will answer all three questions, but many will. 11. Free yourself from the burden of having a quiet time a certain way at a certain time. If first thing in the morning isn’t best for you, try mid-morning, lunchtime, or during an afternoon break. 12. If you normally have your quiet time inside, go outside. 13. If you typically sit while you pray, walk while you pray or kneel while you pray. 14. Make your devotion time special. Read your Bible and pray somewhere that feeds your soul. Or at least minimize distractions. 15. Listen to worship music or Scripture while you get dressed in the morning (smartphones have apps that make this easy). 16. Listen to Scripture on your morning or evening commute. 18. Better yet, begin devotion time with God by writing down things you are thankful for. 19. If boredom or confusion fills your thoughts about God, make a list of God’s attributes. Reread your list, praising God for who He is, not just what He’s done. 20. Write down a prayer of confession. Don’t be general; be specific and watch God release your burdens and free your soul. 21. If you normally pray for yourself or loved ones, broaden your scope; pray for your community, your nation or our world. 22. If you rarely pray for your unsaved family, friends, neighbors or coworkers, start. 24. Before reading your Bible tell God, “Whatever your Word instructs me to do today, I will do.” Then do it. Period. 25. Everyday, tell someone (a spouse, friend, child) what God is teaching you. Spiritual seasons of dryness or staleness are to be expected. So is occasional confusion. If you’re feeling stuck in your devotional life, try one or two of these suggestions. Or try them all. Over the years I’ve incorporated every one of these suggestions in my devotion time to keep my relationship with God fresh and vibrant. Many of the suggestions I practice every day.